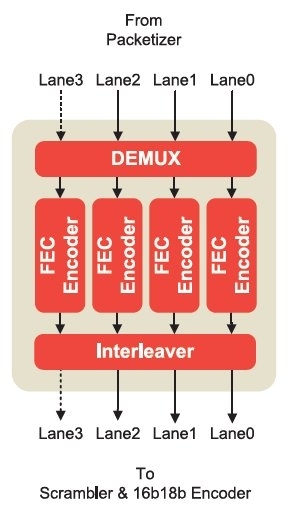 The HDMI Forward Error Correction (FEC) Transmitter IP Core implements Reed-Solomon FEC and symbol mapping/interleaving as specified by the HDMI 2.1 specification. Forward Error Correction is required to ensure glitch-free operation in Fix Rate Lane (FRL) mode, a packet mode introduced in HDMI 2.1. FRL allows for the use of Display Stream Compression (DSC) bitstream transport. Hardent’s IP portfolio offers customers ready-made solutions to accelerate product development and meet demanding time-to-market schedules. Developed by our team of experienced FPGA and ASIC designers, our IP products have undergone extensive verification and offer proven interoperability and compatibility.